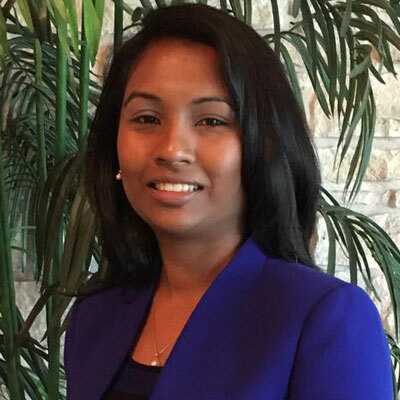 Ms. Deokie Ramlochan-Ramjohn, a citizen of Trinidad and Tobago, serves as the Corporate Services Manager of AlgEternal Technologies, LLC (AET), a company focused on the sustainable application of microalgae as an alternative to fossil hydrocarbons. Deokie holds a B.A. in Business Administration, from Herriot-Watt University, with over 16 years’ experience in providing Corporate Services Support and Management in increasingly senior roles both in the private and public sector. She also holds a Professional Certificate in Events Management from the George Washington University School of Business. Since June 2016, Deokie has provided critical Corporate Services Management functions to AlgEternal, reviewing, amending, and creating where necessary, the internal policies, procedures, and controls to ensure that the Company meets and exceeds internal and statutory reporting requirements. She manages a team that supports procurement, logistics, accounting, and bookkeeping services for AlgEternal, to ensure that the Company maintains good Corporate Governance Standards. She is methodical, comprehensive, and anticipates the needs of the organization ensuring that operations run smoothly and without interruption. A logistics and planning expert, Deokie manages all Corporate events, planning and executing from the sophisticated and elegant to the informal and impromptu, within budget and on schedule. Deokie is also the Brand Ambassador for the AlgAllure™ AlgaRiche™ Skin Care Collection, produced by AlgEternal and appears on the collateral pieces for the collection in print and electronic formats. She takes an active role in promoting the company through volunteerism and is a member of the Noon Lions Club and Rotary Club of La Grange, Texas.